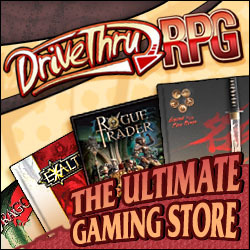 Most of the role-playing games I run or play in are run online. The main benefit for me is that playing online lets me keep together my gaming group despite the fact that we’re scattered across the country now. When I first started playing online we just used an IRC chat. Later on, we added MapTool. Then we moved from IRC to voice chat with first Ventrilo and then Skype. When the D&D Virtual Table first was released as a beta, I got an invite and took a brief look at it. However, the closed beta prevented me from using it for my main game because none of my players had gotten invites or even had D&D Insider subscriptions. Because of that, I continued running my game with MapTool and Skype and hadn’t really thought much about the virtual table since then. Then a couple of weeks ago, I was contacted by one of the guys from GameTable Online, the company working on the D&D Virtual Table, and asked if I’d like a demo session. Since I had never managed to play a game using the virtual table, I gladly accepted the invitation. For the demo, he gave me a quick overview of the program’s functionality and then ran a quick encounter using it. I got a choice of several pre-gen characters or importing one from my own D&D Insider account, and ended up picking a revenant vampire since I could use the demo as a chance to try out the vampire class for the first time too. The encounter was a fight against a few orc minions and a hobgoblin as they attacked a tavern. I managed to barely defeat the raiders with just 2 hp left, but it was fun to play a vampire. Playing through an actual encounter also really helped show off the virtual table’s capabilities in a way that a simple walk-through can’t. The map surface seemed a little less powerful than what MapTool offers, but it definitely has everything you’d need to play D&D. It allows a DM to builds a map from tiles and create tokens to track the position of heroes and monsters. The map surface also supported features like space-by-space movement paths, fog of war, and token statuses which are all useful when running a game. The DM has a range of tiles to use when building a map that is similar to the Dungeon Tile Master Sets that were released as part of the D&D Essentials line, but it doesn’t have an option for importing custom tiles or maps. Similarly, there is a fixed set of token images without the ability to import custom images for monsters. While the tile selection seemed like it would be enough to keep me happy as a DM, I don’t think there are enough tokens available and a lot of monsters would end up with proxy tokens rather than illustrations of the monsters themselves. Unlike MapTool, the D&D Virtual Table includes built-in support for voice chat. This allows users to avoid needing to use multiple programs to run a game online. The virtual table’s voice support also includes a feature called voice fonts that alters the sound of your voice to sound more like certain fantasy races or even the opposite gender. The fonts seem like they could be great for a DM who doesn’t feel comfortable trying out different voices normally. 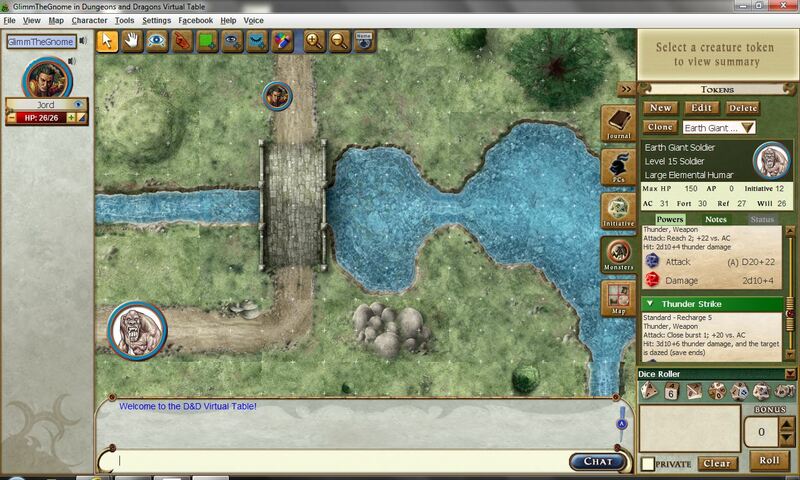 The most impressive feature of the Virtual Table is its integration with the other D&D Insider tools. Players can import characters from their character builder account and the virtual table will expose all of the stats and automatically make macros for initiative, skill, attack, and damage rolls. The DM can do the same with monsters from either the compendium or the adventure tools. Finally, access to the virtual table has now been granted to all D&D Insider subscribers and beta keys are available for subscribers to give out to their players. This solves the problem that originally prevented me from trying it out for my regular campaign since I can now give my players access to the beta. While I don’t think I’ll move my regular game to it right away, I do hope to run a session or two on it sometime soon to see how well it works on the DM’s side of the screen.